Endosterol Phytonutrient Suppositories are a unique patented formulation of ingredients, thoroughly researched and painstakingly selected for quality. In my over 5 years of personally using, and of recommending Endosterol to my clients and customers, this excellent formula has performed admirably. Unsolicited rave reviews from customers have corroborated my own experience. 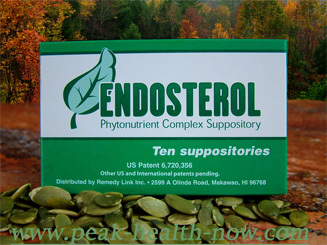 Endosterol ingredients: 250 mg Phytosterol blend (beta sitosterol, sitostanol, campesterol, campestanol), 150 mg Saw Palmetto extract, 100 mg Pumpkin Seed extract, 100 mg Quercetin, 100 mg Dandelion extract, 100 mg Lecithin, 50 mg Magnesium Di-Potassium EDTA, 20 mg Ellagic acid (from raspberry leaf),Gingko Biloba 20 mg.
Buy 6 Boxes and Save $120.00!